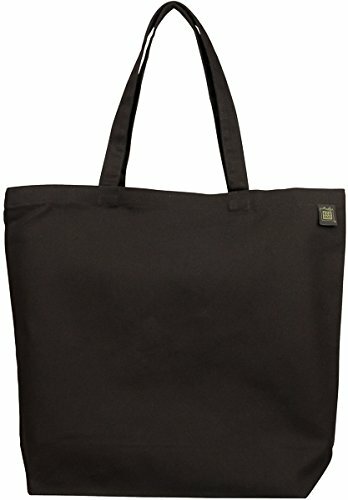 A certified organic black cotton canvas tote great for general carrying and grocery shopping. Sewn with sturdy 10 oz cotton canvas, double stitched at stress points, this bag is ample enough! Easier to carry than a million plastic bags, and these bags will be in your family for years. The average plastic bag takes 125 years to degrade. There are over 100 billion plastic shopping bags used in the United States each year. Less than 1% are recycled. Why not use a bag that you can use over and over again! Size: 19" wide x 15.5" tall with a full 7.5" gusset and 27" handles. The tote is shaped slightly wider at the top than the bottom. The tote is shaped slightly wider at the top than the bottom. If you have any questions about this product by Ecobags, contact us by completing and submitting the form below. If you are looking for a specif part number, please include it with your message.